It was Christmas Eve of 1922. In their suite at the New Willard Hotel, Calvin and Grace Coolidge sat down before Mrs. Coolidge’s radio set—she being an early radio enthusiast—and heard one of early radio’s more memorable broadcasts. That night, 95 years ago, the Coolidges would “listen in” as Mr. Coolidge, then Vice President of the United States, offered pre-recorded Christmas greetings to the American people. What made this broadcast truly memorable was that it involved a new invention, called the pallophotophone. Charles A. Hoxie, a successful and creative engineer with the General Electric Co. (GE), was its creator. This complex, sensitive device, using 35mm film, photographed the sound waves produced by the human voice or any other sound, such as musical instruments, and later reproduced the photographed sound with a perfect clearness. It was this exceptional, high quality sound that was especially noteworthy at the time; it was as though, it was said, the speaker was in the room with you. GE declared the pallophotophone to be “the most accurate recorder of speech and sound ever invented.” Indeed, the sound quality was of such a high grade that the Smithsonian Institution was employing the machine to record the dying Mayan language spoken by the Quiche, an ancient tribe of Guatemalan Indians. Another special feature of the pallophotophone was that the recorded sound waves on film could be reproduced at anytime and anywhere. This made possible pre-recorded broadcasts, something then unheard of in radio, where all broadcasts were live. The original film could also be used to produce multiple copies, which could then be supplied to other radio stations for their use, if desired. Finally, the film copy could be preserved indefinitely. This would allow it to serve as a historical record of important speeches or events. Indeed, to this day, the Museum of Innovation and Science at Schenectady, New York, still preserves a collection of these historic pallophotophone sound films, which can still be heard. Fortunately, the film bearing Coolidge’s Christmas Eve message is among those extant. GE had high hopes for the commercial success of the pallophotophone, which it believed held promise for multiple applications, not only in radio, but also, most importantly, in making motion pictures talk. In late 1922, wishing to publicize the pallophotophone, as well as seeking to test its capabilities, GE arranged to demonstrate its use over the company’s Schenectady, New York, radio station, WGY. This station had then been on the air for about 10 months. It should be noted that the WGY station manager, Marvin P. Rice, was not a radio engineer, as was often the case, but instead a man skilled in public relations. Mr. Rice insured that this special introductory broadcast of the pallophotophone received widespread publicity in the newspapers of the day. If you followed radio news at all, you would have definitely known of the Christmas Eve broadcast. To insure a large audience for the demonstration, GE secured the participation of three prominent officials from the Harding Administration—Vice President Coolidge, Secretary of War John W. Weeks, and Secretary of the Navy Edwin Denby. The plan called for Coolidge to offer a message of Christmas greetings to the public, while the two Secretaries were to speak to present and former military personnel. Under Hoxie’s watchful eye, the participants’ remarks were carefully recorded on the pallophotophone in Washington at the New Willard Hotel. This was done on December 13, 1922, which was 11 days prior to the actual broadcast. One may ask why President Warren G. Harding did not give this Christmas greeting to the nation. The President’s wife, Florence, had been seriously ill for weeks and was only beginning a long convalescence at this time. Perhaps, the President did not want to be troubled. More likely, however, on December 8, his Annual Message to the Congress had been broadcast nationwide over NOF, the Naval Radio Station in Anacostia. He and his advisers might have concluded that another broadcast so soon thereafter would be simply too much radio exposure. As it was the President and Mrs. Harding would spend Christmas Eve dining alone in the White House. For its day, with its mighty 1,500 watts transmitter and towering antenna, WGY was one of the most powerful radio stations in the United States. On a winter’s night, when conditions were just right, its programs could be heard throughout the country, as well as in the Territory of Alaska. On occasion, the station had even been picked up in Europe. Hoping to achieve a long-distance record with its Christmas Eve broadcast, GE requested that the Honolulu Star-Bulletin ask its Hawaiian readers to notify the company if they received the WGY’s signal. 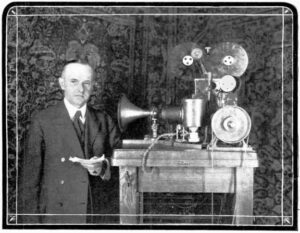 Broadcasting on 400 meters, WGY twice broadcast the recorded speeches of Coolidge and the two Secretaries that Christmas Eve, once at 7:30 PM (EST) and then again at 10:30 PM. The first broadcast was intended for radio listeners in the Eastern States, the second, for those living in the Western States. To fill out the program, a musical performance preceded the addresses and then again during the interval between them. At the start of the program, an announcer requested listeners to report to WGY on the quality of the sound and their geographical location. European listeners were encouraged to cable WGY, with the station paying the charges. The clarity and loudness of the reception were so outstanding that the Times’s radio operator at first refused to believe that the broadcast was coming from WGY, which was about 100 miles distant from New York City. What was Vice President Coolidge’s reaction? During the recording process, he was somewhat puzzled and taken aback when he heard his voice, with its Yankee twang, so clearly and distinctly for the first time. Previously, he had heard his voice only on poorly made, campaign speech recordings, played on the old fashion, hand-cranked gramophone. Mr. Coolidge asked his wife if he really sounded like the voice coming from pallophotophone. In her reassuring way, Grace replied, he did. So, this experience turned out to be a moment of revelation for Mr. Coolidge. For the first time, for better or worse, he now knew how he sounded to others. (Other audio recordings of Mr. Coolidge suggest the tone of his voice may have been somewhat lower than what is heard in the pallophotophone recording.) It should be mentioned that later, as President, when he frequently spoke over radio, the press liked to note his fine radio voice. The Vice President’s message was an excellent one, most appropriate for the occasion, as were those of Secretaries Weeks and Denby. The talks were short, running only a few minutes each, and to the point. Vice President Coolidge, of course, dealt with the religious significance of Christ’s birth. He also offered a picture of this country “as the land of opportunity, where honest effort finds abundant reward.” Weeks and Denby mostly confined their addresses to military related matters and offering kind words to those who had or were serving their country. A transcription of the Vice President’s remarks follows this essay. For those interested, the messages of the Secretaries can be found in the Washington Evening Star of December 25. While this Christmas Eve broadcast was a memorable event in radio history, for the most part, radio historians have given it little attention. Some major radio histories do not even mention it. This may result from fact that the pallophotophone was never the commercial success that GE envisioned. It was a complicated device, really two machines, one for photographing sound waves and another for reproducing them. To operate the machine and process the film required a skilled, trained operator. Moreover, the pallophotophone was an expensive piece of equipment and costly to operate. In short, early radio stations, which mostly operated on a “shoestring budget,” simply could not afford the pallophotophone, no matter how wonderful and useful it was. GE’s station WGY, however, did continue to use the device for a time but gradually interest in it faded away. Among those recorded by pallophotophone were General John J. Pershing, Alfred E. Smith, Thomas Edison, Charles Steinmetz, and Pope Pius XI. Interestingly, on January 30, 1929, a few weeks before Mr. Coolidge retired from the presidency, his 1922 Christmas Eve talk was rebroadcast over WGY as a tribute to him. Then again, in February 1952, it was rebroadcast by WGY in connection with the station’s 30th anniversary. Charles A. Hoxie continued to experiment with his pallophotophone and in a few years, its technology made possible “talking pictures.” The inventor retired from GE in 1932 and lived on until 1941. Today, Hoxie is remembered as “the father of talking pictures”—no small honor. “When the first Christmas came to mankind it brought the assurance that their faith and hope were justified. It revealed the existence of an everlasting righteousness. It established the foundation of the civilization of the Western world. Through all the shifting changes of more than nineteen centuries this revelation has remained, constant, unshaken, secure. “Through the influence of its teachings there has come a recognition of the glory of man. He has been raised up to his true position, ‘a little lower than the angels.’ The universal right of freedom has been acknowledged. Obedience to authority has been sanctified. The existence of a common brotherhood has been disclosed. The ever-abiding obligation of service has been established. “These are the fundamental principles of American institutions. They were not created by man. They cannot be destroyed by man. They have a higher, more imposing source, reaching from everlasting to everlasting. To observe these principles, to live by them, to translate them into action, is the way to good citizenship, to progress and to economic success. There is no other way. The full significance of Christmas is lost unless, as a part of its observance, the American people think of these things. “It is the realization of these great truths that warrants an abounding optimism. They have not failed, they cannot fail. There are times when they may appear to be rejected, but they always emerge strengthened through increasing allegiance, triumphant through enlarging victories. “These are the reasons why our country has no need of revolution. What it needs is perfection. The world waits on the extension of these principles into the practical affairs of people. Their application will be found not in some complicated legislative enactment, not in some abstruse theory, but in the simple and homely experience of everyday life. If more freedom is desired, it can be had by more obedience. If there is need of more brotherhood, it will be found in more service. If success be sought, the way lies open through thrift and industry. If character is wanted, it can be created by hard work and kind deeds. This is the substance of which America has been built. “Of all countries on earth ours needs the least apology. Whatever it is desirable for a people to have, here it may be secured. Opportunity is open. The rewards of effort are sure and large. They are growing better. The full transcription of Vice President Coolidge’s address is available at: http://coolidgefoundation.org/resources/vice-president-1921-19231922-christmas-eve-message/. A short audio excerpt is available, courtesy of the Museum of Innovation and Science at Schenectady, New York, at this link: http://coolidgefoundation.org/calvin-coolidge-2/. Jerry L. Wallace compiled this complete transcription of Vice President Coolidge’s speech from the edited texts of the speech appearing in The New York Times (p. 13) and the Washington Evening Star (p. 4) of December 25, 1922. Elevate your Fourth of July in Plymouth Notch as we celebrate American independence and Calvin Coolidge, the only president born on Independence Day. Compete in the 2018 Calvin Writing Prize, open to students age 13-19 who live or attend school in Vermont. First place prize: $1,500; Runner-Up prize: $500. Deadline: May 11, 2018. Copyright © 2019 Calvin Coolidge Presidential Foundation, Inc.